The B2 Spirit Stealth Bomber looks like one of Batman's rides. 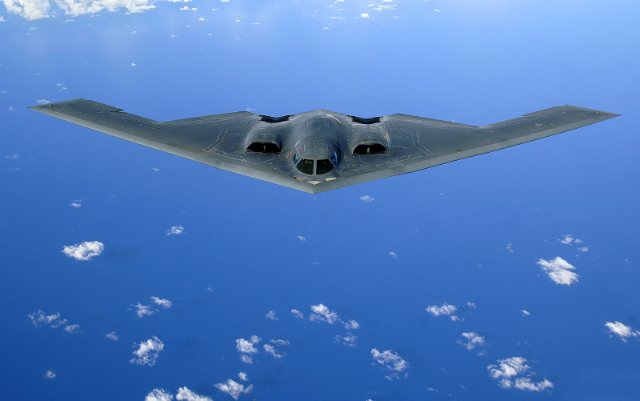 In service since the mid-1990s, the B2's distinctive flying wing shape, even after decades in service, still looks like the future – and an expensive future, at that. Each B2 costs $2.1 billion. As such, only 21 of the stealthy aircraft were ever made. Congress, even in the heyday of "what about potential war with Russia," refused to pay for any more. It's an aircraft with a mystique that comes both from its exotic design and how little information we have on the pilots who fly it, and their experience of flying one of them. Recently, journalist William Langewiesche was given the opportunity to become familiar with the bomber and those that pilot it. More intriguingly, given that the bomber scarcely has space in its cockpit to accommodate a pilot and co-pilot, Langewiesche, by the sound of things, was allowed to join a B2 flight crew on a mission that would take them all the way from the United States to a bombing run on an ISIS camp in Libya. Night came quickly after a short day. Once they passed into the Mediterranean, the pilots used their radar to find three tankers that had come from Germany to meet them for their second refueling, and to map some thunderstorms that were active in the area at the time. Because of its composite structure, the B-2 is particularly vulnerable to static discharges and lightning strikes, and is required to stay 40 miles away from thunderstorms—twice as far as other airplanes. During the refueling and afterward, the B-2 pilots spoke with European air traffic control. The skies cleared. Approximately 250 miles north of the Libyan coastline, the pilots turned south, switched off their transponders, and disappeared from air-traffic-control radar. They had now been flying for 15 hours. Still offshore, they went into a holding pattern that had been planned as a cushion to allow them to get the timing just right. It was nearly midnight Zulu Time—two in the morning local time. They heard the mission controller order the drones to clear out to the south, and authorize them to return immediately after the strike to kill anyone who survived. The drones were MQ-9 Reapers armed with laser-guided supersonic Hellfire missiles. Their pilots were sitting in front of control panels back in the United States. Scatter was surprised by the blanket authorization to fire. He had never heard that one before. I'm not a warmonger by any means: the indiscriminate horrors that modern weapon systems can unleash on soldiers and non-combatives alike are unspeakable. But the window of insight that Langewiesche provides into the little known world of some of the most elite pilots on the planet, the billions of dollars of hardware they're responsible for and the greasy politics that keep the plane flying made for an absolutely fascinating read.